What video formats can playback on LG G8 ThinQ? Can we watch downloaded 4K H.265 movies on LG G8 ThinQ? Why LG G8 ThinQ can't read some songs... Just keep reading, you'll get the best solution to get all movies and music on LG new smartphone. The LG G8 ThinQ concentrates on software features and camera updates, rather than a total design overhaul, though that isn't to say it isn't still a luxurious looking device. The edges around the phone are curvier, so the G8 is a bit more ergonomic in the hand. The front of the phone has a 6.1-inch OLED screen protected by Gorilla Glass 5, with a sharp Quad HD+ (3,120 × 1,440) resolution; it's sharp and gets bright enough to see the screen outdoors. The LG G8 ThinQ has all the specs you'd expect from a flagship Android phone in 2019. There's the powerful Qualcomm Snapdragon 855 processor with 6GB of RAM. There's 128GB of internal storage, plus a MicroSD card slot that lets you expand if you need more space. The G8 packs a 3,500mAh battery that you can juice up either with a USB-C charger that supports Quick Charge 3, or with a Qi wireless charger. It's a good device for watching favorite movies in leisure time. The following will show you how to play any format of video and audio on your phone. Why we can't play some movies or songs on LG G8 ThinQ? Apart from the basic facts, we will tell you how to solve media compatibility problems on LG G8 ThinQ if you like to play MKV, MOV, AVI, WMV, M4V, FLV on it. The solutions is that you can use a format converter or multi-format video player on LG G8 ThinQ. However, the video quality varies from format to format even playing with the same video player. 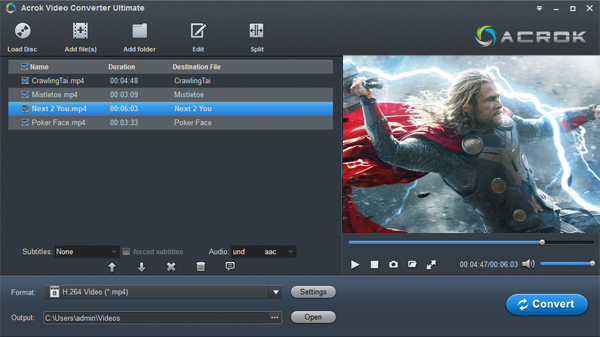 In this case, a video converter will be your best choice to convert videos to be comptibdownloaded MKV, MOV, AVI, WMV video to MP4 with high output quality, convert any music to MP3 for smoothly playing. 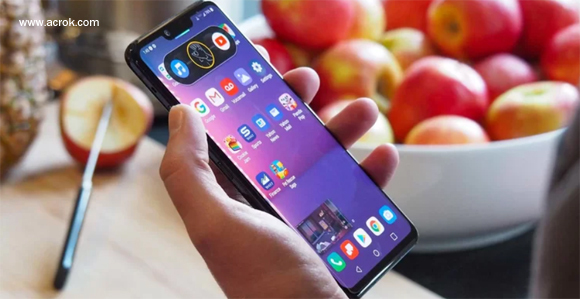 Acrok Video Converter Ultimate is a great video converter that helps you solve any problems when you are playing the videos/audios on LG G8 ThinQ. For Mac users, you can convert any files to LG G8 ThinQ supported formats via Acrok Video Converter Ultimate for Mac. Tip: Nowadays iTunes M4V videos have become widely popular all over the world. However, the purchased or rental iTunes videos are protected by Apple DRM license and cannot play on non-Apple products such as LG G8 ThinQ. So how shall you do if you want to watch iTunes M4V videos on your LG G8 ThinQ? Here comes M4VGO (Windows Version | Mac Version) that is well-evaluated and good at doing the above job. With the professional iTunes Media Converter, you can fast remove iTunes DRM protection and convert iTunes videos/music to LG G8 ThinQ compatible video files such as MP4 and MP3. Then you could easily transfer and enjoy your iTunes movies and music on LG G8 ThinQ on the go! How to convert any movies to LG G8 ThinQ supported video formats? Click "Add Files" to import Blu-ray, DVD and other downloaded movies into it. With its batch conversion function, you can import many files at the same time. And then start your conversion. If you want to combine all the imported video clips into one, just click "Settings" button then check the "Merge all files into one" box at the bottom of the interface. Click the "Format" bar, and then click "Common Video". Finally you can just choose your desired format supported by LG G8 ThinQ, like MP4, 3GP, etc. To get the best experience of video playback on LG G8 ThinQ, you can set your video encoding parameters according to the table below. Just click the button, "Settings" on the lower right of the software interface. There are different options for your video quality, encoders, resolution, frame or birate rate, etc. Moreover, the application has many optimized preset for different devices. You can simply click "Android", "Windows" or "Apple" category to select output option. You can click the "Convert" button at the bottom of the interface and then start to convert movies to LG G8 ThinQ best playback format. This video to LG G8 ThinQ converter works at an ultrafast speed. 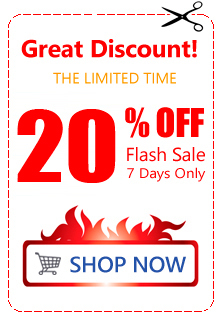 You can finish the conversion process in just a few minutes. You can click the "Open" button to get your converted video. You can copy the converted movies to LG G8 ThinQ via USB cale for playing easily. How to convert any music/song to LG G8 ThinQ supported audio formats? Install and run Acrok program as the best free audio converter for LG G8 ThinQ. Click "Add files" icon to load your music/song/audio files. For playing music on LG G8 ThinQ without any problem, we need to convert your audio files to LG G8 ThinQ compatible format - MP3. You can get this option under "Common Audio" category. After the above steps are done, you can click "Convert" button to convert your music/song to MP3. 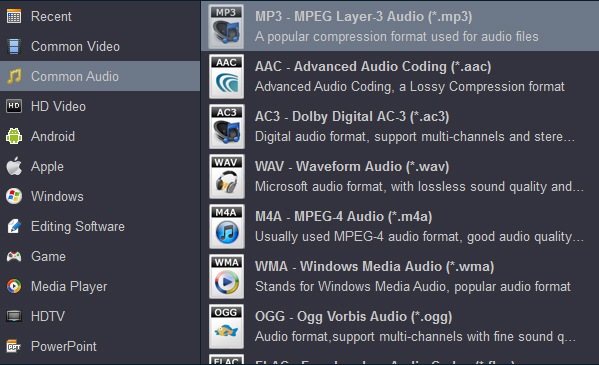 Once the process ends, you can find the generated audio files in the output folder. I like its batch convertion function. When the convertion starts, I can go out for a walk and get what I want when I come back. It works well and is easy to use, wonderful product.